Bishop Donal McKeown and Bishop Ken Good of Derry. Pic: courtesy Church of Ireland. This week the Catholic and Church of Ireland bishops of Derry begin a series of events aimed at promoting reconciliation within the North’s communities as well as highlighting their shared Christian heritage. 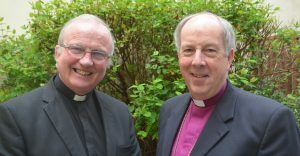 Between 27 and 29 April, Bishop Donal McKeown and Bishop Ken Good will undertake a joint 30-mile walk from St Columba’s birthplace at Gartan in Co. Donegal to St Augustine’s Church in Derry–Londonderry, which is believed to be the site of a sixth century monastery founded by St Columba. The pilgrimage will take place in three stages. As they walk, the two bishops will visit places along the route and pray with parishioners in local churches. On 27 April, the walk will begin at St Columba’s birthplace in Gartan and continue to Conwall Church of Ireland Church in Letterkenny. On 28 April, the walk will go from St Eunan’s Cathedral in Letterkenny to St Aengus’ Church in Burt. Finally, on 29 April, the walk starts from St Aengus’ Church and continues to St Augustine’s Church in Derry. In June, the two bishops will together visit Iona, the small island where St Columba founded another monastery, and the place where the saint died. Later in the year, the bishops will join again for two further walks, one from Claudy to Strabane on Thursday 14 September and from Limavady to Garvagh on Saturday 16 September. St Columba’s last recorded words to his community on Iona were “Preserve with each other sincere charity and peace” and these are inscribed on the large cross marking his birthplace in Gartan. The words have been chosen by the bishops as a guiding theme for their pilgrimages. In a joint statement, Bishops Good and McKeown said “In undertaking this initiative and these pilgrimages, we are inspired by the example of our predecessors and building on our shared Christian identity. St Columba is one of the great figures in Christian history and someone of whom Christians in the North West can be proud. “We are eager to heighten the profile of faith traditions in our dioceses and hope our shared witness to the Gospel will encourage reconciliation in our community.